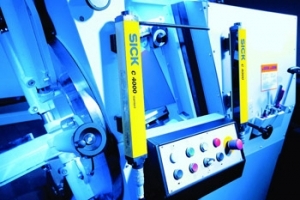 Claiming to overcome the limitations of standard muting safety light curtains, Sick has developed the C4000 to ensure machinery safety in line with the requirements of ISO 13849-1 and IEC 62061, while also delivering reduced costs and improved reliability. The C4000's intelligent beam monitor accurately distinguishes between production objects and people at all times, which eliminates the need for additional muting sensors and lamps. In this way, the light curtain avoids the common failings of standard guards including lamp or sensor failure, misalignment, poor installation and the possibility of manipulation by personnel. When an object breaks the light beams, the Sick C4000 intelligently assesses the broken beam pattern against previously input data. It allows standard sized and shaped pallet- or skid-mounted objects to pass through, while instantly detecting the pattern made by a walking person, even if alongside the pallet. This eliminates the need for complex and high-accuracy set-up using devices such as silhouettes, extra sensors and switches, and other measures, and makes installation quicker and easier. The Sick C4000 Palletiser is TÜV certified to EN 61294-1 and -2 Type 4 and IEC 61508 SIL3, and is suitable for requirements up to EN 954-1.